The St. Andrews Society of the Inland Northwest is a nonprofit organization whose purpose is to promote Scottish culture in the area of Eastern Washington and Northern Idaho. Any activity that furthers that purpose may be a recipient of a scholarship. Members of the Society are invited to contribute to the Society's scholarship fund. Such donations are not used for the general purposes of the Society, but set aside for scholarship use only. Each year, the members of Executive Board shall, based on the Society’s financial position at the end of the prior year and the budgeted revenues and expenditures for the upcoming year, decide whether, in addition to the amounts donated to the scholarship fund, any general funds of the Society may be used for scholarship purposes. A standing Scholarship Committee appointed by the Society’s president evaluates applications for adherence to guidelines and, when appropriate and scholarship funds are available, brings recommendations to the Society’s Executive Board at the next regular meeting of the Board. The Society publicizes to organizations and individuals involved in Scottish culture that scholarships are available from the Society through the Society’s website; the Society’s newsletter, the Thistle Epistle; and other appropriate forms of public announcements. Any person or group, who is a member in good standing of the Society or one of its affiliates, may apply for a scholarship. Scholarship requests may be submitted at any time during the year. Scholarship requests must indicate the activity for which the scholarship application is made. The amount for each scholarship shall be determined by the Executive Board, but shall, in no case, be for more than the cost of the activity for which the scholarship is sought. In this connection, the cost of the activity is deemed to include the cost of any instruction, and the costs of travel and accommodation, where applicable. Awardees of scholarships must provide proof of expenditures to the Scholarship Committee within one month of the expenditures being incurred. Any activity that furthers the purpose of the Society may be considered for a scholarship. However, attending competitions will generally not be considered for scholarships, except where competitors are representing the region in national or international events. 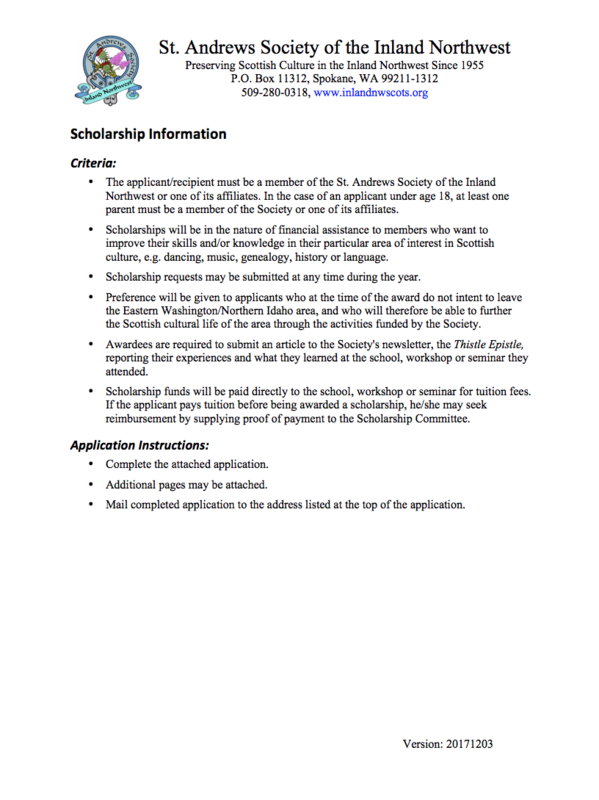 The Board shall determine the award of scholarships. Their decision will be final. Scholarship applications will be considered as they are received until the amounts contributed and appropriated by the Board for scholarships for that year is used. In exceptional circumstances, the Scholarship Committee may recommend and the Board may, at its discretion, award scholarship money in excess of the amount appropriated for the year, while giving due consideration to the overall financial position of the Society. The activity must be in furtherance of the purposes of the Society. Applicant should demonstrate a capacity to benefit from the activity for which the application is made. Such demonstration may be in the form of a letter of recommendation from a person in the community whom the Board believes qualified to make such a recommendation. Preference will be given to applicants who, at the time of the award, do not intent to leave the Eastern Washington/Northern Idaho area, and who will, therefore, be able to further the Scottish cultural life of the area through the activities funded by the Society. Scholarships will be in the nature of financial assistance to members who want to improve their skills or knowledge in their particular area of interest in Scottish culture, e.g., dancing, music, genealogy, history or language. The applicant/recipient must be a member in good standing of the Society or one of its affiliates. In the case of an applicant under age 18, at least one parent must be a member in good standing of the Society or one of its affiliates. Awardees are required to submit an article to the Society’s newsletter, the Thistle Epistle, reporting their experiences and what they learned at the school, workshop or seminar they attended. Download and complete the Scholarship application above. Mail completed application to the address listed at the top of the application.